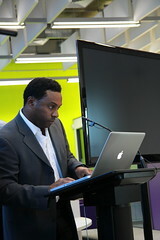 Cornered by Technology: iTunesU launched at University of Plymouth - 13 our lucky number! iTunesU launched at University of Plymouth - 13 our lucky number! hitting the big red button! 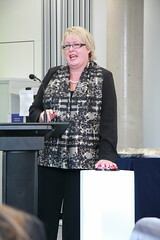 Opened by Prof Wendy Purcell (Vice Chancellor, University of Plymouth) who spoke of her excitement bringing iTunesU to the University. Followed by Lawrence Stephenson, Apple's educational consultant, with a showcase of podcasts from Plymouth's own selection of uploads. Plymouth now the 13th institution to join.